Hermann City Hall is located at 1902 Jefferson Street, Hermann, MO 65041; phone: 573-486-5400. Photo: Market Street, Hermann, MO. Photographed by User:Davekeiser (own work), 2015, [cc-by-4.0 (creativecommons.org/licenses/by-sa/4.0/deed.en)], via Wikimedia Commons, accessed October, 2015. 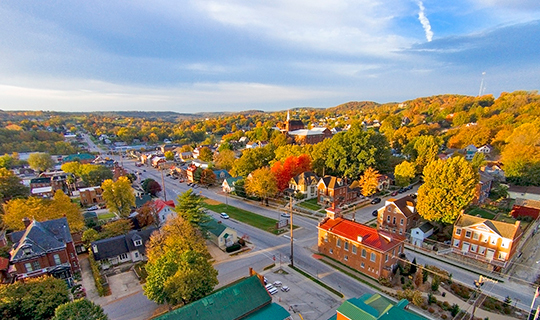 Hermann was designated the county seat of Gasconade County in 1842. Hermann was settled in 1838 by shareholders in the German-American Settlement Society of Philadelphia. Founded in 1836, the Settlement Society was typical of other ethnic and religious colonization societies which sold lots to settlers in a particular western townsite. Motivated by opportunity for cheap land and a desire for isolation, 350 prospective settlers purchased shares in the Society within two weeks of adoption of their constitution. Many contemporaries doubted the Germans' ability to cope with frontier life since most Society members had practiced only teaching and other professions. Even though cheaper land was available, the Society's agent, George F. Bayer, purchased a townsite near the mouth of the Gasconade River at $15 per acre. The Society's plan for Hermann reflected the promoters' faith that their town would someday emerge as a great city. In spite of Hermann's situation upon very irregular topography, the new town was platted in a planned grid similar to Philadelphia. Hermann's Market Street was to be 10 feet wider than Market Street in Philadelphia and only substantial houses were to be constructed. Although Hermann eventually did prosper, the insistence upon valuable homes and gridded streets demonstrates the ignorance of the Society's leadership concerning the hardships of the frontier. The first permanent settlers in Hermann arrived during the Spring of 1838 and were soon followed by a migration of 230 persons. At first the Society controlled town government and colony residents were forbidden from petitioning County Court for incorporation. During 1839 it became obvious that the Philadelphia office of the Society could not effectively administer town government. Society members in Hermann at once recognized the impracticality of fine homes and wide streets in a frontier settlement, the Society's aspiration to build a rival to St. Louis appeared unrealistic to those on the frontier. They relinquished control of the government in 1839.